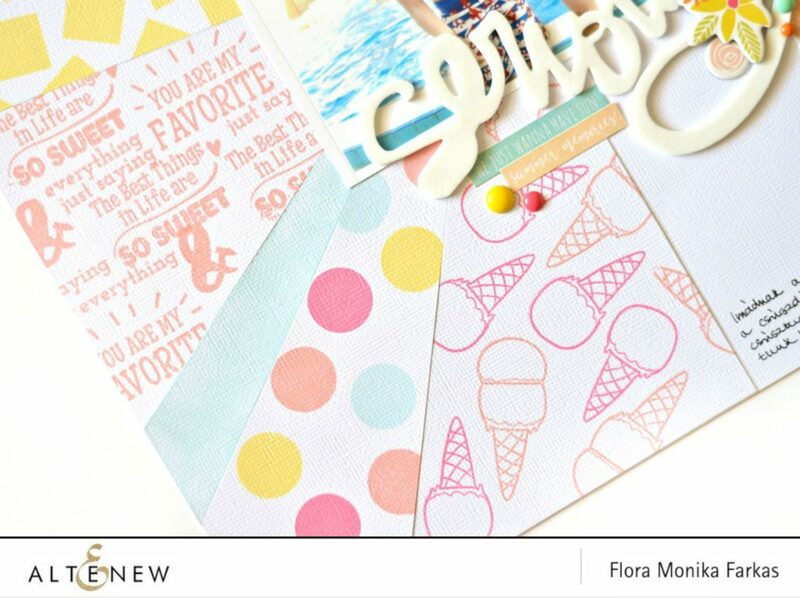 Flóra here featuring some Altenew stamps and inks. Yesterday I was teaching at a scrapbooking retreat in Hungary and now I would like to show you the layout that we were created. 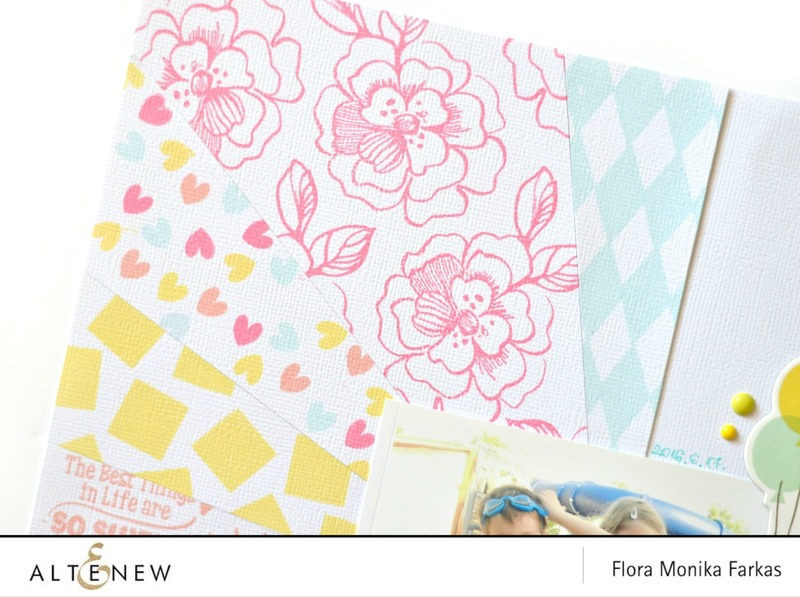 We focused on DIY patterned papers we made with Altenew products. I used three stamp sets on my sample layout: Simple Shapes, Way Too Sweet and Botanical Garden. I chose a color combo inspiration photo from Pinterest and then searched for the matching Altenew Crisp Dye Inks. I really like these fresh, summer colors, they are perfect for summer theme. I used Mango Smoothie, Rouge, Coral Berry and Sea Glass. Then I trimmed a 6″x12″ white cardstock and cut apart like a ray design. Then, I stamped with different patterns and inks. I did this by going from big to small patterns with consecutive colors. As a last step I added Simple Stories stickers, enamel dots, and chipboards to complete my layout. That was my project for today. 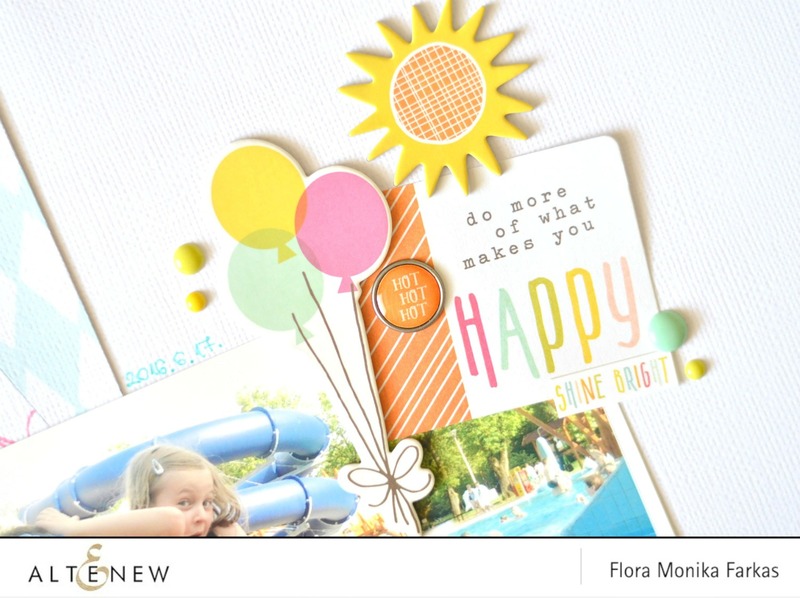 I hope I was able to inspire you to use your stamps on layouts as well. Have a nice day! This is absolutely gorgeous!! LOVE all the different elements to it!! <3 TFS! Thanks Barb! I am very happy you like my page. I love the color you used. Really makes your page pop. Thanks for sharing.